Mercedes has released the first official photos of models A45 AMG. The most powerful version of the new A-class will be shown to public at the Geneva Motor Show in March 2013th. Mercedes should outperform competitors such as BMW M135 with 320 hp or Audi RS3 with 340 HP. 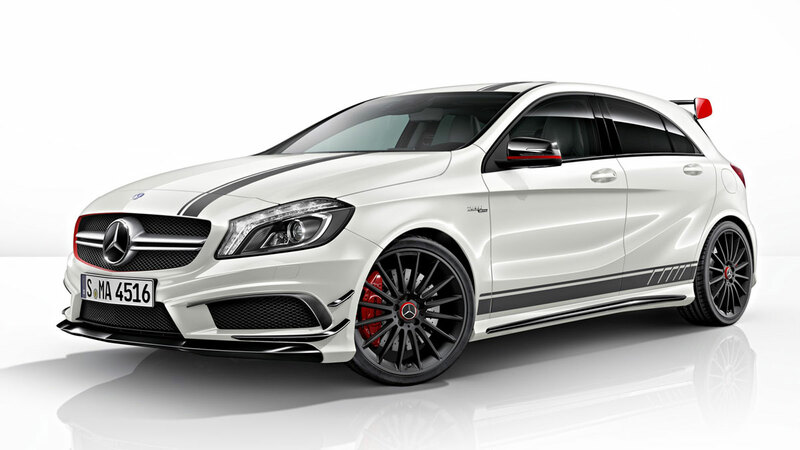 The design is almost identical to the A-class AMG Sport package. 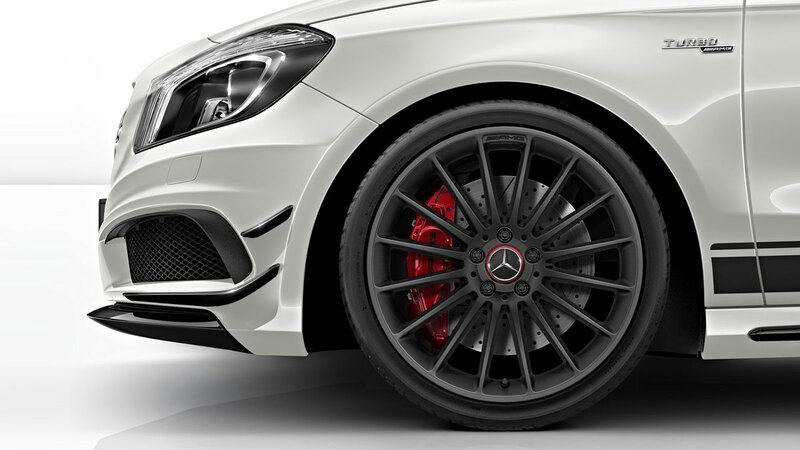 The Mercedes A45 AMG have specially designed black alloy wheels, while the oval exhaust pipes become replaced by trapezoidal. In the cabin dominate dark shades and a combination leather / Alcantara, while the dashboard is lined with a material made ​​of carbon fiber. 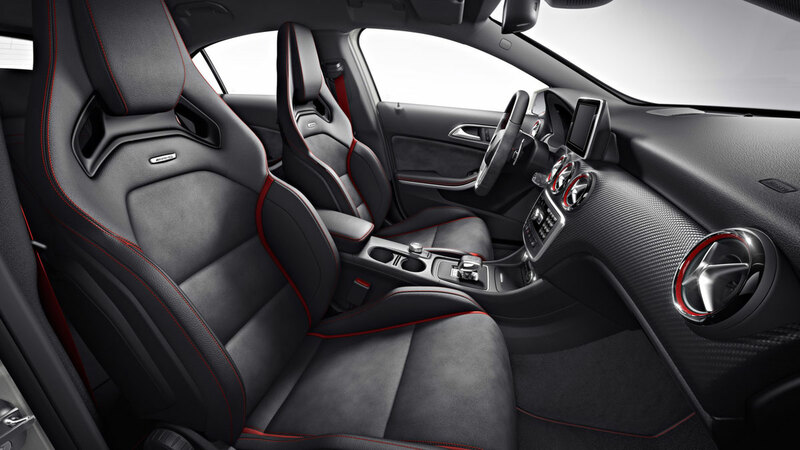 As a contrast black shades, seats and leather steering wheel are quilted with the red thread, as well as a red and round air vents instruments and needles of the safety belts. Special story is engine of A45 AMG. German company engineers have succeeded in the 2.0-liter four-cylinder turbo-petrol engine pull 360 hp and 450 Nm of torque. This configuration will allow the Merc to sprint from naught to 62 mph (100 km/h) in around 4.6 seconds up to an electronically limited maximum speed of 250 km/h (155 mph). This will further come with decent fuel consumption, an average between 6.9-7.1 liters / 100 km, as well as CO2 emissions somewhere between 161 and 165 grams per kilometer. Power is transferred to all wheels via 4MATIC system that is specifically tailored for the new generation of Mercedes-Benz models with front wheel drive. The engine is paired with a seven-speed AMG SPEEDSHIFT DCT automatic transmission with double-clutch technology. Strong drive, follow the modification of the control, braking and suspension systems. Before being offered to customers during the 2013th year, Mercedes A45 AMG will be shown at the upcoming Geneva Motor Show.